﻿ Bayern Munich 1-2 Real Madrid. Ronaldo stuns the Allianz Arena! 12.04.2017 » Bayern Munich 1-2 Real Madrid. Ronaldo stuns the Allianz Arena! Bayern Munich and Real Madrid clashed at the Allianz Arena for the Champions League quarter-finals first leg and once again, the Merengues came out victorious. Vidal scored first for the hosts, but Cristiano Ronaldo stepped up and turned the game around for the Spanish giants with a brace. They did it again! Real Madrid visited one of the most feared stadiums in world football, the Allianz Arena, and beat Bayern Munich by 1-2 in Germany. The hosts started better however and not only they picked up the lead near the 25th minute of the first half, but they also had a golden chance to make it 2 when they were awarded a penalty-kick near the break. Vidal blew it over the cross and that would basically revitalize the Merengues for the second half. Ronaldo scored the equalizer in the 47th minute and then still got Javi Martinez sent off by forcing the Spanish player to foul him twice and receive 2 straight yellow cards. The final blow was delivered in the 77th minute, with the Portuguese superstar beating Neuer for the second time on the night and putting Madrid on the driving seat for the second leg... The two teams meet again next week, this time at the Santiago Bernabéu. A brace from Cristiano Ronaldo was enough to secure a 2-1 victory for Real Madrid in the Champions League quarterfinals first leg tonight in Munich. It was a fantastic result, however, it's hard to wonder if Madrid would have done well to secure a third goal effectively killing off the tie. Ronaldo's brace gave him a record 100 goals in the Champions League, as he became the first player in the tournament's history to cross the 100 goal mark. Despite the good final result, the match didn't start well for Madrid. 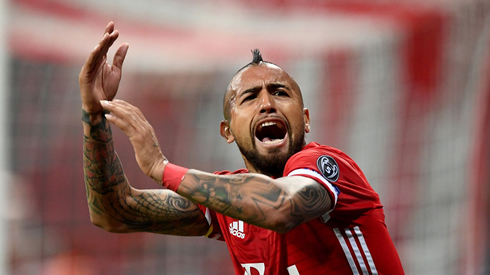 Bayern Munchen were very aggressive early and the Merengues struggled to deal with Arturo Vidal in the center of the park. The Chilean would eventually put Bayern up with a powerful header midway through the first half. Real Madrid still struggled to settle and things almost went from bad to worse when a Franck Ribery shot ricocheted off of Dani Carvajal's chest. However, it appeared to the referee that the ball struck his hand and the penalty was awarded. But with the footballing gods looking down on Madrid, Vidal smashed his effort over the bar and Madrid went into the half at 1-1. Real Madrid came out looking like a far better outfit in the second half and got rewarded after a Dani Carvajal cross fell to Cristiano Ronaldo. His one-time finish was perfectly placed past Manuel Neuer and Madrid were back in business at 1-1. Then the tie would change. Javi Martinez was given his marching orders after a second foul on Ronaldo. With Bayern Munich down to 10, Real Madrid took the game to the German side. Neuer, however, was a wall deflecting any and everything in his path. But Ronaldo wouldn't be denied after a few tries and he was able to put away his second after a great assist from Asensio (who came on for an injured Gareth Bale). Ronaldo toe-poked his shot past Neuer and peeled off into his celebration. Sergio Ramos appeared to have netted another one late, but the Spanish captain was rightfully brought back for offside. Real Madrid wouldn't be able to put in a third despite multiple chances, but they will certainly be very happy with this result as they head into the second leg. Cristiano Ronaldo next game is a La Liga fixture, on April 15 of 2017 against Sporting Gijón. You can watch Juventus live stream, Sporting Gijón vs Real Madrid, Barcelona vs Real Sociedad, Anderlecht vs Manchester United, Lyon vs Besiktas, and Ajax vs Schalke 04, all matches provided from our stream live game pages.